GRAMMY-nominated Special Consensus joins forces with bluegrass music’s brightest stars on COUNTRY BOY, a bluegrass tribute to John Denver. There is a natural affinity between bluegrass and John Denver’s repertoire but this is the first purely bluegrass tribute to the iconic singer/songwriter who died in 1997. 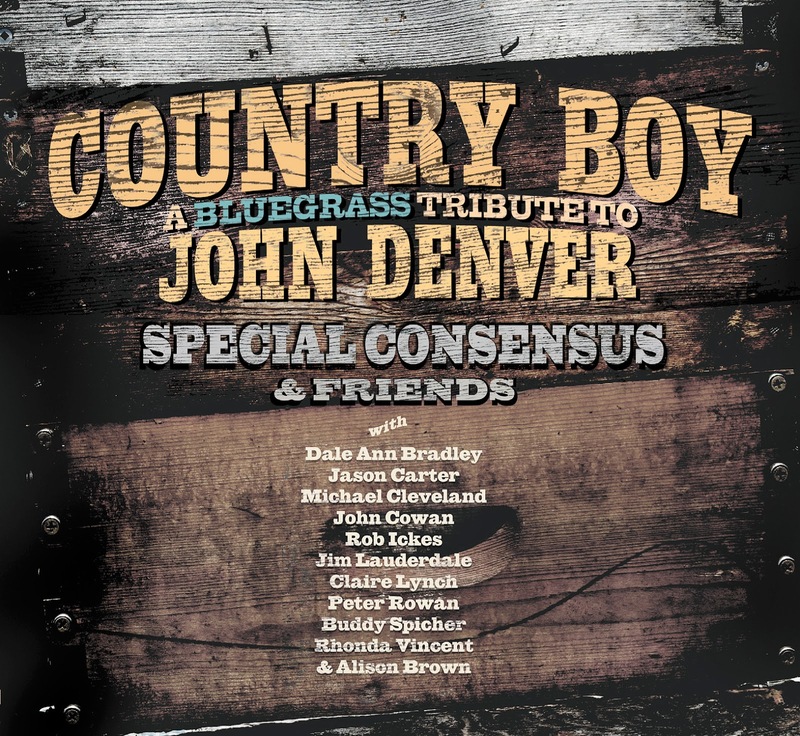 COUNTRY BOY showcases Special Consensus at the musical center of each track with a guest cast of Grammy-winning and International Bluegrass Music Association-winning vocalists and instrumentalists. Produced by Alison Brown, the album features a solid 10 song set of Denver hits and lesser known songs. Stand out tracks include “Country Roads” (with John Cowan sharing lead vocal duties), “Back Home Again” (with Dale Ann Bradley on a vocal duet), “Wild Montana Skies” (with reigning Female Vocalist of the Year Claire Lynch) and “Thank God I’m a Country Boy” done as an instrumental featuring twin fiddles (Michael Cleveland and Buddy Spicher) AND twin banjos (Greg Cahill and Alison Brown). Peter Rowan’s distinctive step-out vocal on “Rocky Mountain High” is sure to become a must have for bluegrass fans as is Jim Lauderdale’s countrified rendition of “Poems, Prayers and Promises.” Other guests on the project include Rhonda Vincent, Rob Ickes and Jason Carter. Special Consensus was founded in 1975 by banjoist Greg Cahill as a showcase for his urban traditionalist take on bluegrass which encompasses elements of Chicago blues, swing, newgrass, and country music. Over the intervening 37 years, the group has seen a myriad of personnel changes and has been the breeding ground for some of the best young stars in bluegrass today; Josh Williams, Chris Jones and Robbie Fulks are just a few names in a long list of former members who have gone on to build solo careers. Special Consensus maintains a busy year round touring schedule, reaching an eclectic demographic through appearances at festivals, listening rooms, bluegrass in the schools programs and symphony appearances. Their GRAMMY-nominated 2012 release Scratch Gravel Road was a top 10 album on the bluegrass charts.